At least 80 human individuals were unearthed during three seasons of excavation at Bakr Awa. The most numerous are the series from the Islamic Period and the Bronze Age (more than 30 individuals from each period), less numerous is the series from the Iron Age (about 14 individuals). Unfortunately some of the skeletal remains came from looting pits and their chronology is not known. Conducted anthropological analysis was aimed at reconstruction of demography and biological condition of past population. Biochemical analysis of bone collagen was aimed at reconstruction of diet of Bakr Awa’s historical population. Despite the archaeological period, most of the adults died in their 30s and 40s, only a few were more than 50 years old at the moment of death. Remains of newborns were found only in the Bronze Age layers. 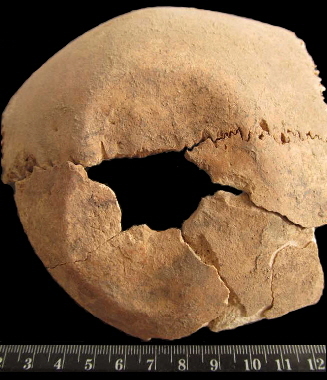 Trephination of parietal bone, mature woman (Bronze Age). 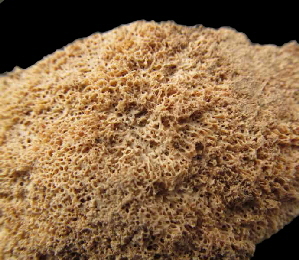 Crushed lumbar vertebra, young woman (Bronze Age). 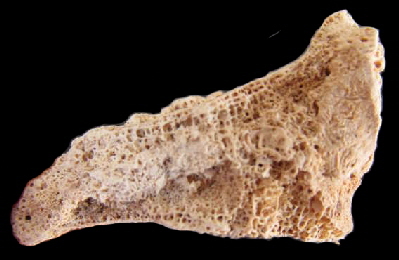 Porotic hyperostosis of parietal bone, child (Islamic Period). The most frequent paleopathological conditions were periodontal diseases, like caries lesions or linear enamel hypoplasia. On the postcranial skeleton the most common were degenerative diseases of joints. Single cases of trepanation, bone cancer and healed skull injury were also noted. The biological condition of individuals does not show significant differences between chronological periods, except the caries lesion which were more frequent among individuals from the Islamic Period. The stable isotope analysis of carbon and nitrogen shows significant differences in composition of the human bone collagen between individuals from the Bronze Age and from both Iron Age and Islamic Period. The difference between the Iron Age and the Islamic Period was not significant. The observed difference in collagen composition could be an effect of differences in diet of individuals from the studied periods. The change in diet could be an effect of change in agricultural or herding practices.